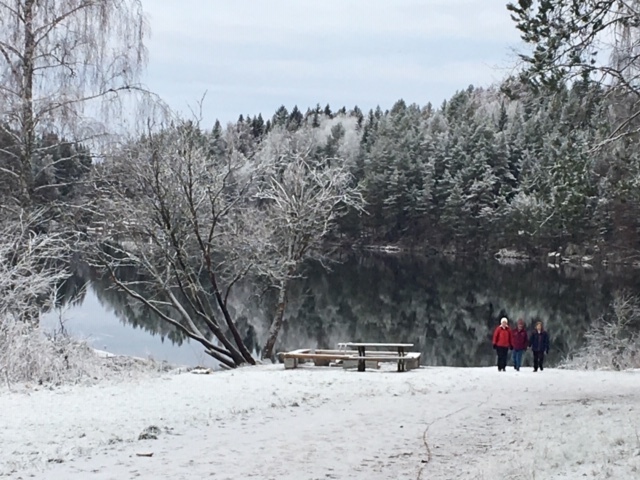 PHOTO FEATURE: While winter has arrived in much of Northern Norway and in the mountains, the Oslo area has been mostly free of snow so far. A sudden drop in temperatures over the weekend provided some frosty landscapes, but state meteorologists warned Tuesday that they may not last long. This placid scene could be found on Sunday in Oslo’s eastern forest (Østmarka), just a short walk from the trail-head parking lot at Rustadsaga in the busy urban area between Bøler and Skullerud. 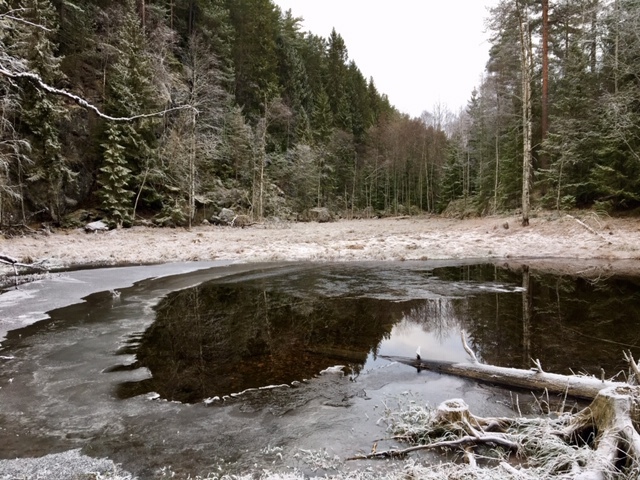 The popular lake known as Nøklevann provided plenty of dampness in the air that froze on trees, bushes and the forest road. 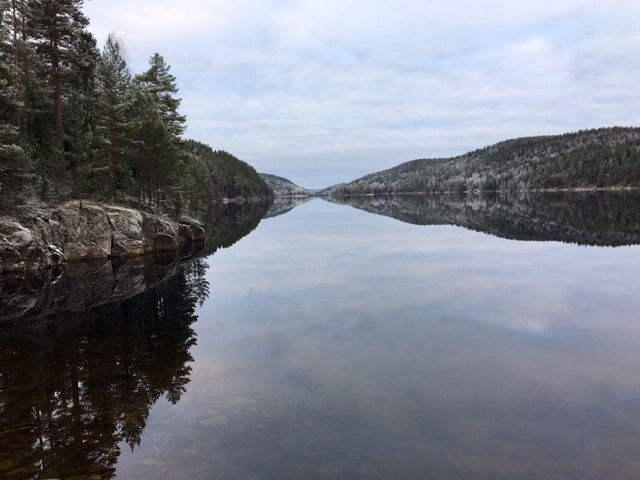 The lakes aren’t frozen yet, even though ice was forming on some of them like here in a bay of the lake called Nord-Elvåga, a few kilometers east of Nøklevann. Some lakes can look like they’re covered with ice, but it’s by no means safe to walk out on. The long and narrow Nord-Elvåga is in an especially scenic part of Østmarka that’s easily accessible by bus and metro, and then by foot, bicycle, skis or canoes in the summertime. Oslo is graced with such tranquility so close to downtown. Some eager ski clubs and sports organizations seized the opportunity to start running snow-making machines, creating some ski trails over the weekend in Oppegård, Nittedal, Sørkedalen and Skullerud. 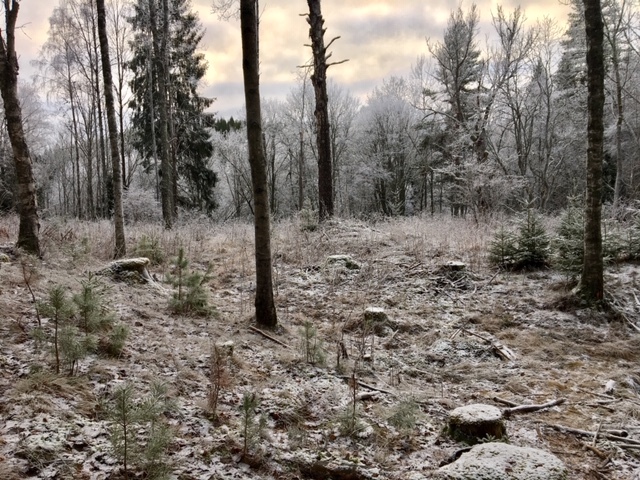 Others were content with the quiet frosty forest until more of the white stuff falls naturally. A change in the cold, wintry weather was forecast from Wednesday, however, when state meteorologists predict a rise in temperatures and rain, heavy at times, especially on Thursday. 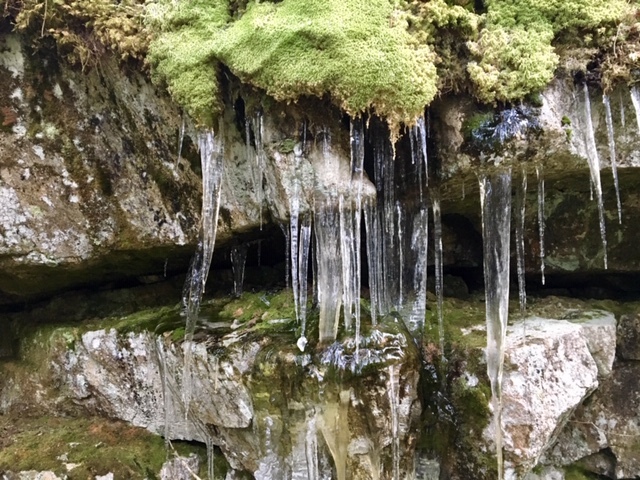 Some of the icicles seen forming from rocks in the forest may stick around through. It’s unusual to see them like this, in contrast to green moss.